Best Services loves referrals from our customers. If you have a friend you would like to refer, please fill out the short from below and someone form our office will contact them. If they sign up for service with us we will apply a discount on your next cleaning service. You receive a $25 off your next cleaning after their 3rd service. 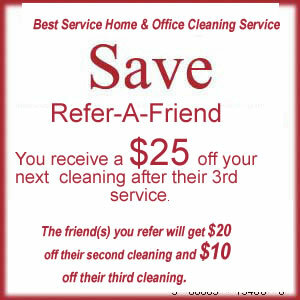 The friend(s) you refer will get $20 off their second cleaning and $10 off their third cleaning. Don’t keep your cleaning service all to yourself ‿ share the news with your friends and profit! If you would like to refer us to a friend or loved one you may use the form below.